Welcome to Moose Hollow 708! Whether relaxing on the brand new fully reclining leather couch, enjoying the fresh air on the private balcony, or visiting one of the many outdoor recreation hot spots just steps away from your front door, you are sure to have an amazing vacation in MH708. Main Level: Kitchen, living room with TV and fireplace, full bathroom, balcony, and bedroom. Downstairs: Bedroom with ensuite bathroom, standard bedroom with full hallway bathroom, and laundry room. Bedroom 2: 1 King bed master suite with ensuite bathroom and patio. Bedroom 3: 1 Queen bed with full hallways bathroom. 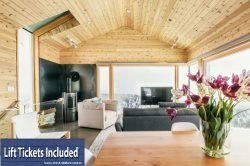 We are truly excited and honored to share our homes with each and every guest and we invite you to stay with us at Powder Mountain Getaways - MH708!